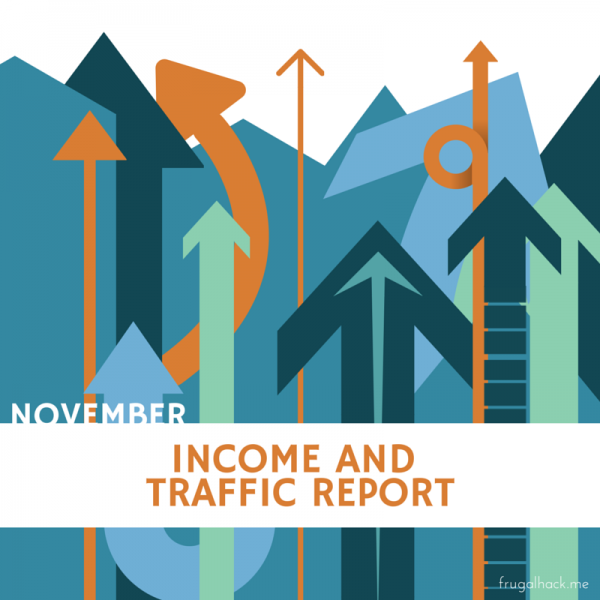 Here we are with another month in the books, which means it’s time for my monthly income and traffic report. If you are new to my blog or these reports, don’t worry. I’ll give you a quick rundown explaining what these posts are. Every month, I make it a point to post the previous month’s income and traffic received on this blog. Why? Because I feel it’s important to stay transparent and accountable for everything I post. Blogging is far from a get rich quick scheme, regardless of what most people think, so I just want to highlight that. If you are interested in the previous three reports, you can check them out below. November has been my best month yet in terms of traffic and I’m not talking about just one statistic, I’m talking about all of them! This is likely thanks to a number of shares and trackbacks from higher profile blogs (e.g. Doctor of Credit, View From the Wing), more posts per week (4-5), and better content (or at least more posts that I was proud of). I never look at my monthly statistics until I start writing my monthly income and traffic report, so these statistics have me pumped! For the number inclined readers, November saw a 16% increase in views and a 10% increase in visitors. This is a huge increase for my blog. In fact, this month topped my previous best month (August) by 2% in views and 22% in visitors. That’s pretty sweet. Money Order Prices and Locations – I’m surprised this post has been my most popular post for the last few months, because it’s a bit outdated. I would love to update it, so if you have any data points on stores that sell money orders, please comment on that post. Load Serve With a Debit Card or Credit Card – This is a great way to add $1,000-$3,000 worth of MS to your monthly portfolio. If you don’t have Serve, don’t forget that you can load Bluebird and REDcard online with a debit card as well. Beginner’s Guide: Reselling on Amazon – If you’re new to reselling or if you want to learn about the process, this is the post for you. This post is directed at beginner’s who have never resold anything in their lives, so you do not need any experience. Send Money From Serve to Your Bank – This is one way to liquidate your money, but it’s much faster and easier to bill pay straight from Serve or send yourself a check. Vanilla Reloads – Sometimes Vanillas can be found where you least expect them (e.g. grocery stores, gas stations, local stores). This month’s blog income is significantly less than last month, but there’s a few reasons for that. First, there are less days in November than there are in October. Second, I ran a contest at the end of last month. Finally, ad earnings require clicks and I’m assuming there weren’t as many desirable ads this month as their were last month. I’m not sure how the month with the most views and visitors saw such low ad revenue, but it seems like that can be very finicky. Either way, this month was still positive, which is really all I care about. This was the best month I’ve ever had thanks to you guys! I really appreciate everyone who visits, subscribes, shares, likes, comments, recommends, and reads my blog. You are all awesome! If you have any suggestions as to how I could continue making my blog better, please leave them in the comments.